Property Details: 3 Bedroom, 3 Bathroom Beach Home with more than 1700 sq. 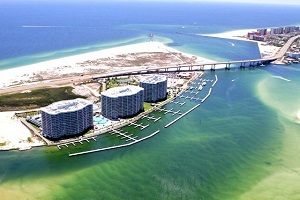 ft.
Caribe condominium home, Orange Beach real estate sales. Caribe resort is an amenity rich resort condo complex with many pools ( indoor and outdoor), lazy river, fitness center, putting green, atrium, and much more. This unit has a highly desirable view of The Gulf of Mexico and Ole River. Very clean unit with excellent rental history. Unit features KitchenAid appliances and beautiful granite counter tops. Best of both worlds with boat access and a beach shuttle. Walking distance to Cobalt Restaurant. Unit is sold furnished minus a few personal items. Come see this resort home at Caribe Condos in Orange Beach AL.